Mexico's economy minister sent Donald Trump a fighting message: We will retaliate right away if you hit us with a "major border tax." "It's very clear that we have to be prepared to immediately be able to neutralize the impact of a measure of that nature," economy minister Ildefonso Guajardo said Friday on a Mexican news show. Guajardo also predicted that Trump's threat of a 35% tariff against Mexico, if carried out, would result in a "global recession" because it would inhibit companies from producing outside the U.S.
"It would be a problem for the entire world," Guajardo warned. A Trump tariff "will have a wave of impacts that can take us into a global recession," Guajardo said, speaking in Spanish. In recent weeks, Trump has zeroed in on companies manufacturing in Mexico and selling products in the United States, threatening them with a "major border tax" of 35%. In tweets, Trump has singled out GM and Toyota as potential targets, though he indicated in a December tweet the tax would apply to all businesses, not just automakers. And during his first press conference Wednesday since winning the election, Trump doubled down on his threat. "There will be a major border tax on these companies that are leaving and getting away with murder," Trump said Wednesday. Guajardo noted that Toyota has extensive U.S. operations and employs a lot of American workers. "If I were Mr. Trump, I'd treat them with more respect," Guajardo said. Trump's economic advisers have said they will use the threat of tariffs to get a better trade deal with Mexico. They've indicated renegotiating NAFTA, the free trade deal between Canada, Mexico and the U.S., is a Day 1 priority. Mexico's President, Enrique Pena Nieto, said he's open to "modernizing" NAFTA. 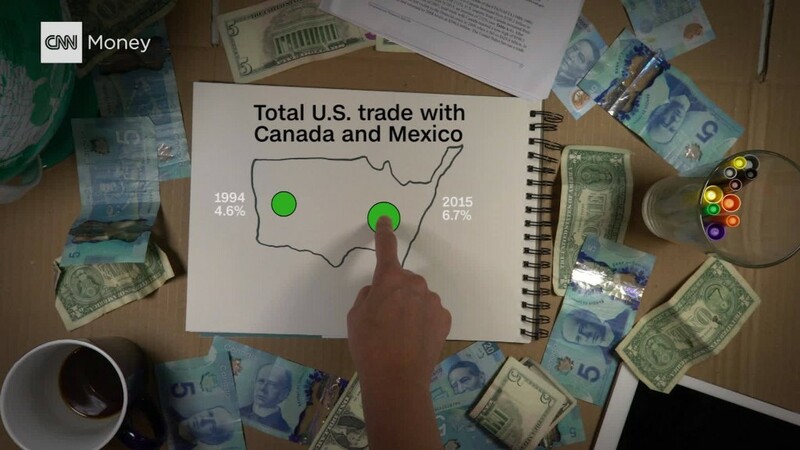 Mexico heavily depends on trade with the United States to drive its economy and create jobs. And the U.S. Chamber of Commerce estimates six million U.S. jobs depend on trade with Mexico. Trade experts on both sides of the border warn that stiff tariffs would risk jobs in both countries. Guajardo didn't say exactly how Mexico would hit back. "There are ways -- it's very clear how -- to take a fiscal action that clearly neutralizes it," Guajardo said. Trump's threats have already weighed on Mexico. The peso plunged after the election and remains near an all-time low. Mexico's central bank dimmed its economic forecast this year, citing the U.S. election outcome.